Lest We Forget, November 11th is a very special day. It is not a day about trick or treating. That is Halloween. It is not a day about gifts from me, Santa Claus. That is Christmas. It is a day about a very different but more important kind of gift. Lest We Forget, November 11th is a very special day. Some of my friends call November 11th Remembrance Day. Some call it Armistice Day. Some call it Veteran’s Day. This special day is about the gift of freedom. It is about the men and women who gave us that gift. Today we remember what they did for us. 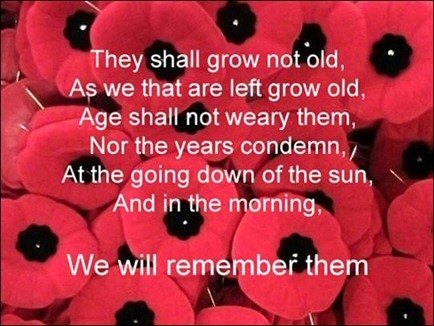 Lest We Forget, they fought, and are still fighting, in wars. They fought so we could have freedom. Many of them died. Many more of them were hurt. We must always remember what they did so we could have freedom. Do you want to know what I do after I bring toys on Christmas Eve? I like to do it very much. It means a lot to me. Lots of kids send letters to ask for things for moms and dads who are soldiers. These troops are gone from loved ones. Most are far, far from home. They give up fun things at Christmas time. The troops work hard to make sure we are free. They take care of others and keep them safe. Boys and girls miss their moms and dads who are troops. Their moms and dads miss them just as much. The letters ask me if I can do something nice for them this time of year. So early Christmas day when I have brought all the gifts, I drop bags from my sleigh. The care bags hold small things to remind the troops of home. Treats like candy canes, fruit, nuts, cards, and letters from home. These things let them know we think about them at Christmas. They are still in our hearts when they are not here. P.S. Do you know someone who is away from home? Can you think of one thing you can do to let them know you still think about them? Do you have a great idea to help out the troops? You can click here to tell me or scroll down to see what other people have written! hi santa i think you are cool. thank you for all the gifts. Love it! !merry christmas,i went to show my respect on poppy day in my local town! i would like to help the end of war so would many war a little things that stand in our way of freedome i know that everyone dreams of peace so y dont we axsepte that and stop the conflict us children will be adults and mabey we can turn things around! Thankyou for those who have died and suffer for us we now have the freedome we want but what about them? One of my brothers was in the army.I’m glad he is home with his wife and daughter. Hello Santa. It’s me Jayden. Happy Veteran’s day, Santa. We will all remember what these brave men and women have done. How do you fly one day and get so many children. I love you❤. Next PostNext The New Santa Claus Webcam!